$25.00 In stock. Order in the next 12 hours, 8 minutes and it will go out today! Robert Baxt has put the classic Miser's Dream on steroids. Even Amazekids' Danny Orleans, who has his own fabulous version of this trick, loves Baxt's approach. This is a super-easy, laugh-filled routine! It's light on the sleights, but heavy on the fun, and the DVD includes all the jokes, the bits, the gags -- plus all the tips so you can do it! If you want to get a ton of laughs with little effort, pulling coins out of a kid's ear is a classic, sure-fire way to go! Why? Because kids respond to money -- and money is funny, especially when it's found in unexpected places! 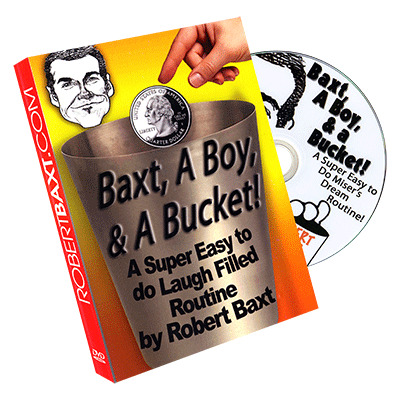 Robert has sold more than 2000 copies of this 60-minute DVD. Check out the trailer at the top of the AmazeKids web page. When you watch it, you'll see why this coin pail routine has been a successful part of his show for many years.